As part of my MSc in eLearning at Edinburgh University I am currently studying a unit on digital games based learning. Part of the course requires me to write a weblog (over 12 weeks). My university weblog has not attracted many comments recently so I thought I would open it up and re post some of my thoughts here for a wider audience. It is likely my next few posts will relate to digital games so please feel free to comment. Your thoughts and view are always appreciated! Pac Man was a game that I was first introduced to as a child in the late 1980s. I can’t remember which computer I played the game on, but Amstrad springs to mind. 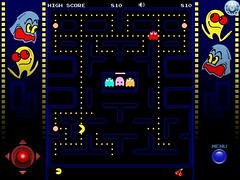 The Pac-Man movements are controlled by the game player. The object of Pac-Man is to eat as many Pac-dots as you can without getting eaten by the different colored ghosts that roam around the pac maze. If you eat a large Pac-dot it will turn all the ghosts blue. When the ghosts are blue, you (Pac-Man) can in turn eat them. Fruit also appears at random points in the maze. If you eat these fruits you will gain more points. For the purpose of the course, I downloaded Pac-Man “lite” (the free version) for my iPad. I think this is a great little game for testing reaction time and small scale problem solving. However in terms of learning, I am not sure exactly what the player *is* learning? I guess there is a certain amount of physical finger coordination to be learned and perhaps the Thinking Correctly Under Pressure (TCUP) theory, but how could this be applied in another context? Perhaps when playing sport and choosing your tactics? This entry was posted in Professional and tagged GBL, MSc on 11 February, 2011 by Tess Watson.